Behaviour of redox-sensitive trace metals in recent and ancient aquatic ecosystems like coastal environments (e.g. tidal flats of the southern North Sea) or anoxic basins (e.g. Baltic Sea, Black Sea). In particular, I am interested in transfer reactions between the dissolved and particulate phase and the coupling to microbial and sedimentological processes under changing redox conditions. This includes processes in the open water column and in the sediments (pore water, groundwater). 2000-2006 PostDoc at the Institute for Chemistry and Biology of the Marine Environment (ICBM, University of Oldenburg) in the Microbiogeochemistry Group of H.-J. Brumsack. 2006-2009 PostDoc at the Leibniz Institute for Baltic Sea Research, Marine Geology department. 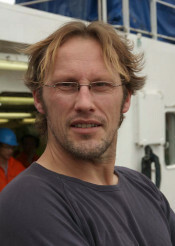 Since 2009-09 Senior scientist at the Leibniz Institute for Baltic Sea Research, Marine Geology department. „Redox-sensitive Transformationen in Wassersäule und Sediment des nordfriesischen Wattenmeeres“ in cooperation with Michael E. Böttcher (IOW) and Justus E. E. van Beusekom (AWI). Funding by DFG. BONUS – AMBER „Assessment and Modelling Baltic Ecosystem Response“. Coordination J. Dippner (IOW). Funding by BMBF. Wegwerth, A., Dellwig, O., Kaiser, J., Ménot, G., Bard, E., Shumilovskikh, L., Schnetger, B., Kleinhanns, I.C., Wille, M., Arz, H.W., (2014) Meltwater events and the Mediterranean reconnection at the Saalian–Eemian transition in the Black Sea. Earth and Planetary Science Letters 404, 124-135. Kowalski, N., Dellwig, O., Beck, M., Gräwe, U., Neubert, N., Nägler, T., Badewien, T.H., Brumsack, H.-J., van Beusekom, J.E.E., Böttcher, M.E., 2013. Pelagic molybdenum concentration anomalies and the impact of sediment resuspension on the molybdenum budget in two tidal systems of the North Sea. Geochimica et Cosmochimica Acta 119, 198-211. Dellwig, O., Schnetger, B., Brumsack, H.-J., Grossart, H.-P., Umlauf, L. (2012) Dissolved reactive manganese at pelagic redoxclines (part II): Hydrodynamic conditions for accumulation. Journal of Marine Systems 90, 31-41. Dellwig, O., Leipe, T., März, C., Glockzin, M., Pollehne, F., Schnetger, B., Yakushev, E.V., Böttcher, M.E., Brumsack, H.-J. (2010) A new particulate Mn-Fe-P-shuttle at the redoxcline of anoxic basins. Geochimica et Cosmochimica Acta 74, 7100-7115. Dellwig, O., Bosselmann, K., Kolsch, S., Hentscher, M., Hinrichs, J., Bottcher, M.E., Reuter, R., Brumsack, H.-J. (2007) Sources and fate of manganese in a tidal basin of the German Wadden Sea. J. Sea Res. 57, 1-18. Böttcher M. E., Gehlken P., Gratthof G. G., Schmidt B. C., Effenberger H. S., Geprägs P., Bahlo R., Dellwig O., Leipe T., Neugebauer C., Winde V., Baldermann A., Deutschmann A., Stark A., Gallego-Torres D., and Martinez-Ruiz F. C. (2012) BaMn[CO3]2 - a previously unrecognized double carbonate in brackish sediments: Structural, spectroscopic, and textural tools for future identification. Chemie der Erde - Geochemistry 72, 85-89. Dellwig O., Brumsack H.J., Böttcher M.E. (1996) Geochemical characterization of a Holocene sedimentary sequence from the NW german coastal area, in Bottrell, H.S., ed., Fourth International Symposium on the Geochemistry of the Earth`s Surface: Ilkley, England, p. 43-46.